Traditional bike lights solve several problems — they let you see where you're going, and they let other people see you. But they won't stop a driver from turning into you if you happen to be in their blind spot. 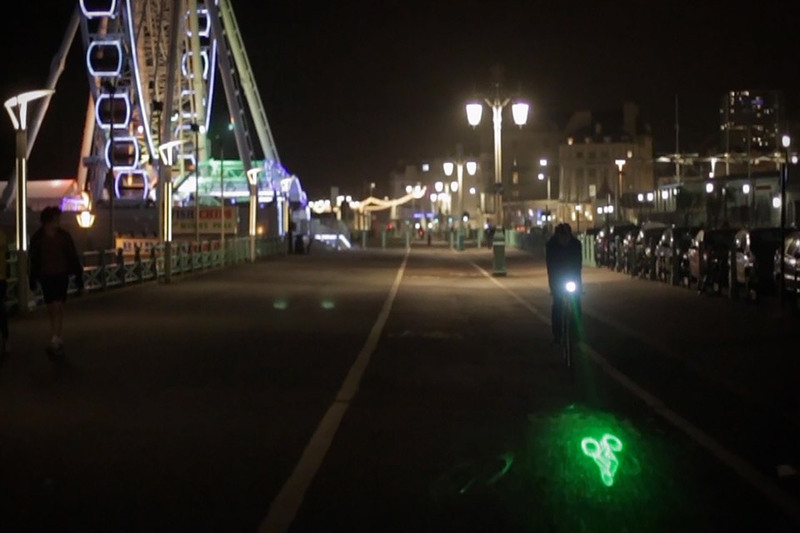 The Blaze Bike Laserlight will. This ingenious add-on serves as a traditional front-facing lamp, but also includes a green laser light that projects the image of a bike on the road roughly 15 feet in front of you, letting motorists know you're coming before you're even there. The internal Li-ion battery lasts for up to 13 hours, and the body is waterproof, so the only thing you really need to worry about is pedaling. Forget about strapping chains to your wheels, buying snow tires, or filling the bed of your truck with sandbags — no, what you really need this winter is Track N Go. While most other track systems for your truck require expensive and time consuming installation, as well as pretty considerable alterations, with Track N Go, all you need to do is drive on top and attach. In as little as 15 minutes, you're ready to go, tackling the toughest winter conditions imaginable. Power comes directly from the wheels on your truck, easily driving the track system without impacting handling and turning. Yes, it's technically billed as "the world's first one-wheeled self balancing electric skateboard." But the fact of the matter is that the Onewheel isn't really a skateboard at all — it's a whole new experience. Powered by state-of-the-art batteries and a new type of brushless hub motor, it uses a host of sensors to allow you to move up to 12 mph, over a range of 4-6 miles, by doing nothing more than hopping aboard, leaning forward to accelerate, and leaning backward to slow down and stop. All of which sounds much easier than kicking the ground/bailing into the grass. Your bike doesn't need to be armed with grappling hooks, armor-piercing cannons, and machine guns to pull off the Dark Motorcycle Helmet — though it definitely wouldn't hurt if you were cruising on something resembling the Batpod. No, this helmet is made for the not-quite-average guy with a penchant for the unique (even if he doesn't spend his nights fighting crime). Molded from a proprietary elastomer material, this DOT-approved full face helmet features interchangeable clear and tinted visors, and flexible points at the top for a silhouette that's sure to get a few looks. Removable liners and adjustable vents help keep things cool, while multiple vents reduce fog and keep you comfortable. Make the best use possible of the limited space in your Jeep or truck with Smittybilt Gear Seat Covers ($100 and up) — they give your seats all the protection of a normal seat cover, with plenty of pockets, sleeves, and containers for all the gear you need on the road. Available in a range of sizes and configurations, you can use them to cover the front seats of your jeep, the rear bench seat, or just about any truck seat. Their modular design lets you add and remove pouches to create your ideal storage layout, customizing them to accommodate whatever gear you choose to bring with you. Made from 600 denier polyester with a PVC liner, they are highly durable and available in coyote tan, OD green, and black. Looking for a way to launch your creative ideas? Squarespace's all-in-one platform provides all the tools you need to organize your dreams in one space. 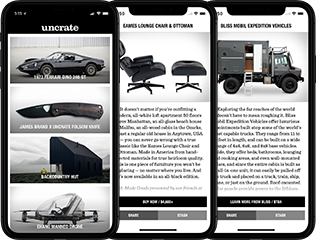 Whether you're kick-starting a business or looking for ways to showcase your portfolio, Squarespace's all in one platform has everything you need to launch with confidence - no coding or plug-ins needed. Set yourself apart with your Squarespace website today. Long commutes, hilly rides, and difficult terrain may have you reconsidering the whole biking to work thing — but before you go replacing your bike with some expensive electric vehicle, consider the Copenhagen Wheel ($800). This simple device replaces the rear wheel of your standard bicycle, giving you the extra boost of power you need to overcome any commuting obstacle. With a built-in motor, it will help you tackle hills, or just show up to work a little less sweaty. And with wireless connectivity, and the accompanying app, you can tailor your ride to fit your needs, or just keep track of all the good you're doing for your body while biking instead of driving. Instead of forcing you to invest in a new boat and gear every time your taste for adventure changes — technical rapids, open ocean, lake fishing — with Point 65N Modular Kayaks all you need to do is add or remove a component. They have everything from solo to tandem kayaks, meant for all sorts of water sports. Their modular, snap-together design makes them easy to customize, and gives them the added benefit of being highly portable, without sacrificing buoyancy and handling. All you need to do to get your boat to the water is break it down and throw it in the back of your vehicle (no need for a roof rack and tie-downs).